The author disagrees with those waiting for "The Rapture" to happen and by combining the historical record of its beginning and growth, with a proper understanding of the Scriptures, shows where they are mistaken. Reverend McDougall of Scotland gives the Jesuit (Catholic) origin of the false "rapture" doctrine. He covers a great deal of ground within a small number of pages as he enlightens the reader with documented support explaining the origin and purpose behind the invention of the "secret rapture" theory. He shows how the general acceptance of this false theory has had a negative effect on Christianity and consequently society in general. 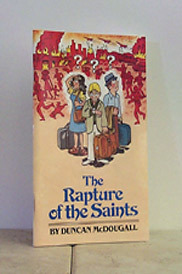 This is a controversial book to say the least not only because of the nature of the subject but because of Reverend McDougall's relentless attack on Roman Catholicism and his severe criticism of several Christian groups that have been caught up in the "rapture" phenomenon. Nevertheless when dealing with his primary subject . . . the "secret rapture" of the saints he has provided an abundance of documentation that completely supports his argument. The author adds to the value of his narrative by giving a synopsis of important past events such as The Oxford Movement The Brethern Movement The Tractarian Movement and the principal characters of each and how those movements accepted and embraced the rapture theory. The primary focus of this work however is on the individual who invented the rapture theory, his reason for doing so, and those who have continued to promote this error for more than two hundred years. The Rapture of the Saints is a very strong and convincing presentation for the other side of the rapture story. The original manuscript has been revised slightly and annotated by Reverend Curtis Clair Ewing and Eric C. Peters and presented here for the readers enlightenment. The Rapture Of The Saints 5.0000 out of 5 based on 1 ratings. I've read this book and it is truly a blessing! For years I fought the pre-tribulation rapture theory, trying to place the events in correct order (there isn't one! ), trying to make sense of the marriage supper of the Lamb, how they would feast while the righteous who remained on earth were suffering for the faith of Jesus. You will not regret having this book if you truly love the truth!